Former US Navy pilots shared their experience about a close encounter with Unidentified Flying Object. According to NYT, in 2004 two F/A-18F Super Hornets belonging to the USS Nimitz aircraft carrier were flying a routine mission 100 miles off the coast of San Diego when a nearby U.S. Navy guided missile cruiser, the USS Princeton, contacted them and asked what type of weapons they were carrying. 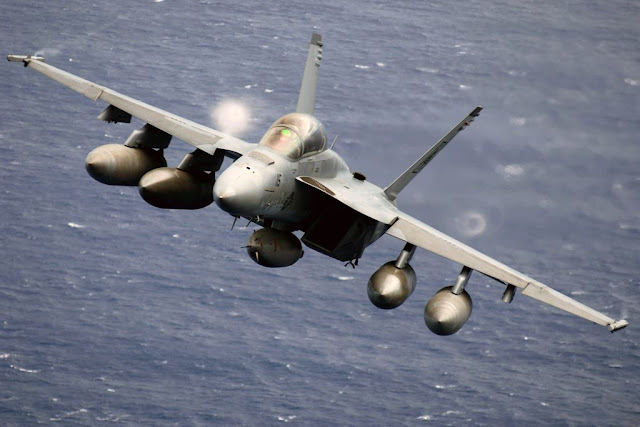 The Super Hornet pilots, Navy Cmdr. David Fravor and Navy Lt. Cmdr. Jim Slaight, replied they were carrying dummy AIM-9 Sidewinder air-to-air missiles that could not be fired. The USS Princeton officers said they had traced an unidentified object and they instrcuted Fravor and Slaight to investigate about it alerting them that the objects were not identified. The pilots could see anything and nothing was on their radars, but when Fravor looked down to the sea he noticed that the waves were breaking over something below the surface, causing the sea to churn. Hovering about 50 feet above the churn was an aircraft of some sort that was whitish, 40 feet long and oval in shape, Fravor recounted. He described to the NYT that it was jumping erratically but not moving in any specific direction. Fravor began a circular descent in an effort to get a closer encounter, but the object began ascending toward him as if it were trying to meet him halfway, he explained. He then abandoned his slow circular descent and decided to fly straight towards the object, but it quickly flew away. Fravor and Slaight received instructions from USS Nimitz ops officers to fly to a rendezvous point, called Cap point, about 60 miles away. As they were flying, the Princeton radioed again saying that radar had picked up the strange aircraft close to the Hornets' Cap point. When the fighter jets tried to track the object, it had disappeared and Fravor and Slaight returned to the USS Nimitz. According to the NYT, this and other similar events have been studied in a program funded by the US Department of Defense to investigate the presence of UFOs. It has been active from 2007 to 2012, but according to the supporters of the program, it is still alive and active.